I didn't mean to make this blog a guide to quintessential gastro-delights. I still don't know how to categorize my awe and likeness to a particular epicurean discovery. I see myself as a humble lover of food, not all food actually, my senses and palate need to be wooed first. You can see me buying dishes at particular "pares" joint or getting burgers at Jollibee, however, you can also easily spot me at some fine dining scenes for those very special occasions and some event invitations. With that said, let me share one of those rare point in time, where a modest foodie have stepped into Manila’s signature European fine-dining restaurant-The Tivoli of Mandarin Orental Manila. Style RPA and Juenevie Forever Young have organized one luxe event showcasing the newest and the only exclusive anti-aging at home spa services yet in the country. As the event drives to put emphasis on luxurious and stress-reducing living, a stellar menu was also prepared for us. Imagine being one of these people seated in this long elegantly designed table in white and hues of blue. The private event was held at one of the function rooms of The Tivoli. Scenery artworks in bright yellow contrasted the plain velvety black walls. The white svelte chairs did not only give comfort but blended magnificently to the whole theme of the room. As you can see the seemingly beautiful owner of Juenevie. Michelle Lim in pastel pink, blends meticulously well with the set up. 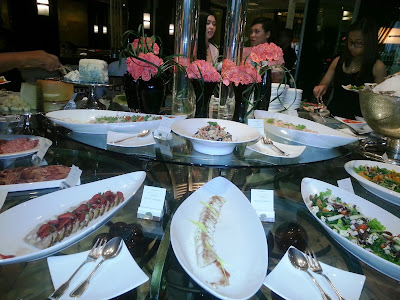 The menu that was prepared for us consisted of a tempting buffet spread of appetizer- a selection of shucked oysters, sushi, seafood, meat dishes, imported cold cuts and cheeses and salad greens and the works. Prior to our buffet indulgence, I found myself enjoying chatting with new found blogger friends while unmindfully indulging myself with their papadums and sunflower encrusted rustic breads. Here is my plate of appetizer. Upon seeing this, I realized and questioned myself why didn't I have visited the buffet more than once. Then again it hit me, with the photo my smart phone was able to capture, the appertivo or appetizer is to stimulate your appetite, not fill your hunger, you silly. Then it arrived! Everyone silent awaiting for their main course. 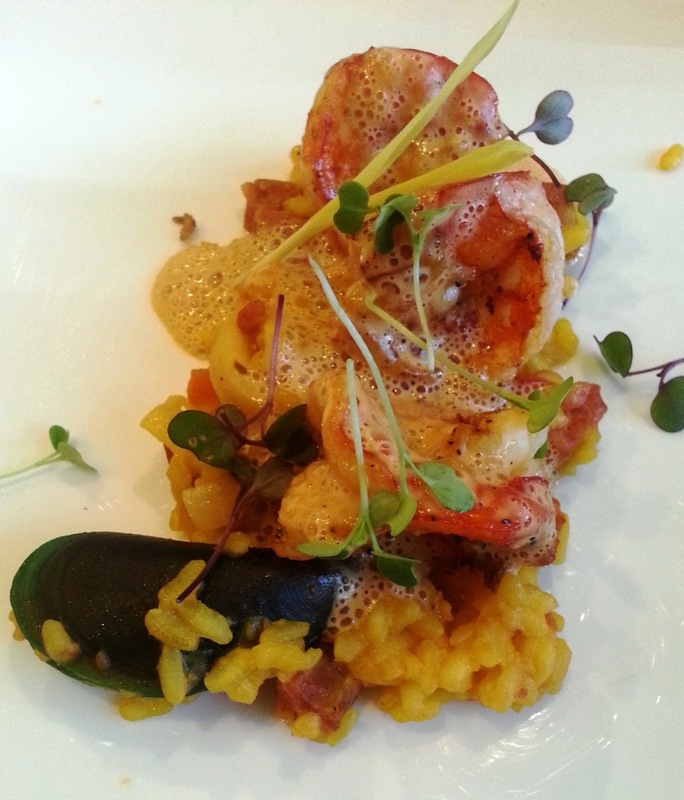 Some had the Roasted cerveza negra marinated pork belly, while some of us had Grilled King Prawn with chorizo paella with lobster foam. One fine example of molecular gastronomy that I had, the lobster foam, deserved to be in the helm of the food connoisseurs top list to try. Yes, in all honesty, I almost lost the audacity to begin to devour the craftsmanship that is on my plate. Don't ask me anymore if I finished the whole plate. But will still tell you that I haven't spoken a clear word except, yum, while I was in the process of digging and masticating this. I could have shouted or even cursed if I was alone in the room because it was just so dreamy. An explosion of saffron, prawn, and subtle lobster flavor began in my mouth. Of course everyone chanted, "please leave some room for dessert," even though many of us have become uneasy in our movement having stuffed up in the tummy. Pity those who didn't stay for Mont Blanc with Rum Anglaise and Crumble. The Tivoli's version of the French dessert meringue. Bit by bit, I was persistent to delve into this with much finesse as possible. Starting from the dark Belgian chocolate, then with the coffee crumble of meringue texture, then becoming familiar with the whipped cream over the the miniature chestnut flavored cake. The rum anglaise gave a sizzling spin to the whole dessert. 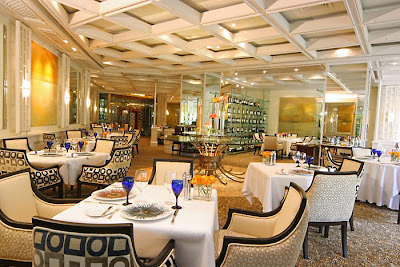 How's that for a lunch in the lap of luxury at the classic restaurant from one of the time-honored hotel in Makati. I respect your well-written and thoughtful content. You’ve really hit the mark with your original and bold views here. I agree with your views. Specially i liked the way you used pictures. Your readers are fortunate to have such interesting material to read. Thanks and regards! !